The Disney Store at Ala Moana Center was crowded with customers when the store opened at 4 a.m. An early bird sale of 20 percent off was offered until 10 a.m. When Fay Wengler arrived at the Disney Store yesterday morning at about 4:10 a.m., she was in for a rude surprise: The store at Ala Moana Center already was jumping, with at least 70 shoppers buzzing through isles of "Chicken Little" action figures, "Incredibles" toys and Disney Princess merchandise. "The alarm went off at 3:15, but the snooze button seems to work pretty well," Wengler said, explaining why she got to the store 10 minutes after its doors opened at 4 a.m.
"I don't know how we function this early in the morning," she said. As the holiday shopping season kicked off yesterday, the Disney Store in Ala Moana embodied the new culture of holiday shopping -- one in which retailers open increasingly earlier and customers flock to the early-bird bargains. It knocked an additional 20 percent off sales prices for people willing to come in early. "It's like this every year, and we keep opening earlier every year," said Tina Jones, manager of the Disney Store, which opened at 5 a.m. last year the day after Thanksgiving. If the consumers' battle cry once was "Shop 'til you drop," it now seems to be "Shop while you sleepwalk." "That's true," said Jon Kawata, general manager of Sears in Ala Moana, which was flooded with an estimated 1,500 customers five minutes after it opened at 6 a.m. Some shoppers had camped out all night. "People have a shopping ritual that they go through," Kawata said. "They're smart shoppers. They're bargain hunting. And they want to enjoy that thrill of the deal." Known as Black Friday, the day after Thanksgiving is when many retailers begin to turn a profit. Tracy Mullin, president and chief executive of the National Retail Federation in Washington, D.C., says this year retailers are working hard to lure customers out of bed. "This will go down as one of the earliest and most promotional Black Fridays in history," Mullin said in a news release. "Many stores opened earlier than ever before, and retailers offered unbelievable sales and discounts to get people shopping." Last year, shoppers spent $22.8 billion the weekend after Thanksgiving, the federation reported. It expects sales to increase by about 6 percent this season over that. "This year, retailers have learned the meaning of the phrase, 'if you discount, they will come,'" Mullin said. "Lukewarm promotions on Black Friday won't get consumers out of bed, so most stores went all out this year to ensure that they were part of the holiday hype." Kamaile Nihipali drove all the way in from Laie with plans to hit the Disney Store, then KB Toys, which opened at 5 a.m. Nihipali had loaded up with board games -- "Hungry, Hungry Hippo," "Monopoly," and "Scrabble" -- which were on sale for as low as $9.99. Although the $59.99 remote controlled Humvee that was almost as large as a real compact car might have seemed an impulse buy, Nihipali vowed that she was being disciplined. "Everything we got here is on our list," she said. Before dawn, Angel Falig of Waikiki had already been to Best Buy, where he bought a Kodak digital camera for $129 and memory cards to go with it. Dawn found him and his friend Krista Cruz camped out in the doorway of the Apple Store, waiting to buy what's expected to be one of the year's biggest sellers, an iPod. "This is my main priority," said Falig. "We've got a Mini already, and she wants a Nano." Macy's also was seeing throngs. The department store was running a promotion giving customers game cards worth $10 to $500 off purchases. By 10 a.m., it had given away 17,000 cards, said Lavina Wong, director of special events at Macy's in Ala Moana. Wong said that didn't necessarily mean Macy's had had 17,000 customers, but she said it was a good sign. 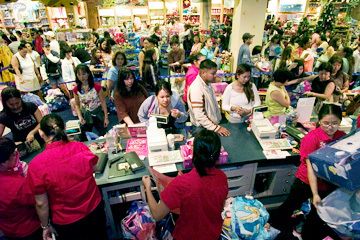 The Black Friday scene at Windward Mall was mellower. Security guards Kaipo Finau and John Pei arrived for work at 4 a.m. to find that "the line wasn't as big" as previous years, Finau said. There were no incidents among shoppers in line, as reported in some mainland cities. Customers were lined up outside the mall as early as 3:30 a.m., said Kim Person, marketing manager. Jack and Lei Souza and their daughter Amber arrived at 5:15 a.m., but had not been pulling a shopping all-nighter. "Usually we let our other daughters do this," Lei said, but this year they decided to brave the door buster scene at Windward Mall. Going to town was out of the question for mom and dad -- but their older daughters drove to town in the predawn hours. Charlene Harding and her neighbor Suzie Thompson got to the mall before 6:30 a.m. The two live on Marine Corps Base Hawaii in Kaneohe and their husbands, both Marines, are home for the holidays and were watching the kids. At KB Toys, both women were impressed with the orderliness of the store and the helpfulness of the staff. They were surprised to learn that some of the people wearing KB shirts were volunteers. Maria Seu, a teacher, and other friends, including a respiratory therapist, and a public school vice principal, volunteered to help the store manager and arrived for work at 4:30 a.m.
Seu explained that like other shoppers, they have experienced disorganization, poor customer service and frustration on the busiest shopping day of the year and have felt "If only the (store) were doing it this way ..."
Star-Bulletin reporter Erika Engle contributed to this report.